We recently went through an open shelving journey- as we dwindled down 2 bookcases worth of books and decorative accent to fit onto 2 shelves (*Gulp!*). We struggled with whether or not we should go with open shelving, or a closed shelving wall unit. Due to the large amount of decorative objects we have to show off, we chose the open shelving method. 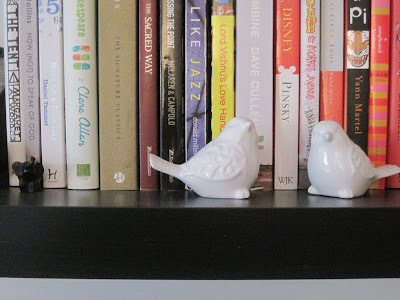 We used 2 LACK floating shelves from IKEA-which is a pretty tried and true product. However, we weren't too impressed with the new brackets used to hold the device. I was stressed that they'd fall off the wall within the first 24 hours.. but it's been a couple of months, and they're still holding up. Open shelving is a concept growing in popularity as the home is being used to showcase treasures that people come across in their personal journeys. However, the bigggest danger of open shelving is that it can quickly become a clutter hot spot. -When filling shelves, choose items that occupy the space well. Crowding a shelf with a multitude of smaller items will look too cluttered. -Carry a common neutral color throughout the shelves. Choose a warm white or off-white as a grounding color and then distrubute accent colors accordingly. -There is power in repetition- arrange items in symmetrical positions to add visual interest. -Keep playing with it until you get the display just right. Reposition the books and accents until you're satisfied- and don't get too committed- switch up the display as often as you like! 1. Books! Incorporate books in varying sizes and mix up the hardcovers with some soft covers. Try arranging the spines in blocks of color, or create dust jackets out of thick paper and generate some uniformity for the shelf. 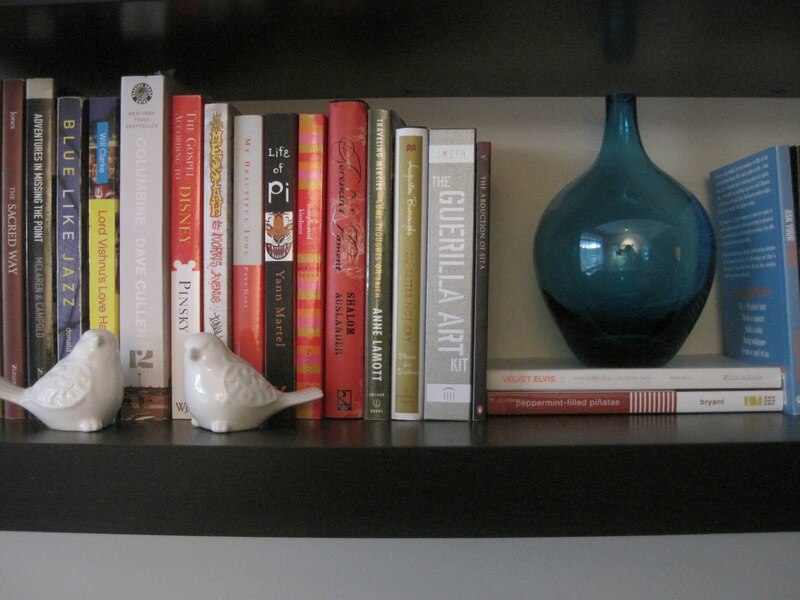 Use books as the framework for decorative accents by laying them flat and positioning objects on them. 2. Boxes are both versatile for a shelf and also can add a pretty pattern. I have a series of boxes with a multi-colored vine pattern on it that I purchased from IKEA 4 years ago. These boxes house delicate coasters, tea lights, and essential oils- items that we frequently use, but in the boxes have a nicer display. Similarily to books, use boxes to prop up items from a collection. 3. Baskets can be purchased in wicker to add a natural texture, or covered in fabric with pattern for a soft look. Use baskets to house loose papers, remote controls, and other commonly used items. Keep in mind, a basket is a useful tool- not another junk drawer- so try to keep 'em clean!